Are you fed up with your government? Are you concerned about the future of your country, and what it'll be like for the young Americans who will inherit it from us? Do you wish you could take some kind of action - but aren't sure what you can do that will make any difference at all? How to Press America's Reset Button lays out exactly how you can take back control of your government by severing the ever-increasing power that lobbyists, billionaires, and other special-interest groups have over our elected officials. This down-to-earth, easy-to-listen-to handbook was written by a man whose concern for his children's future inspired him to search for a way that he could personally change the country's course for the better. 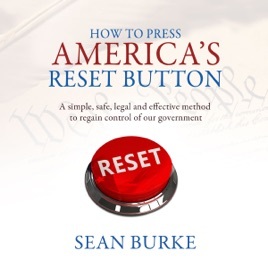 After months of exhaustive research, he stumbled upon America's "reset button," a key to fixing our government that every American can put into action. How to Press America's Reset Button doesn't favor any party, nor does it bash any individual, group or ideology. Instead, it offers a specific, effective solution Americans can use to actively - and very easily - put their country on a new path of repair, stability,and growth. Surprisingly simple and incredibly powerful, pressing the reset button will completely upend how business is currently conducted in Washington. It's not a hope or a wish, but a way to make real change - before things get so bad, there's no turning back.